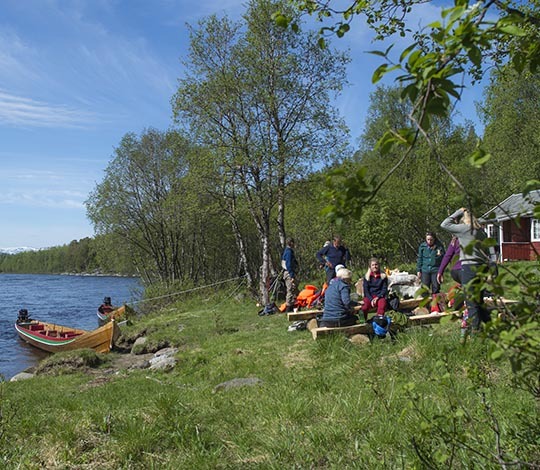 Sorrisniva is in the middle of nature’s larder: the river, fjord and plateau offer excellent raw materials for the Chef to turn into delicious dishes. On Saturday March 10th the restaurant will be closed for bookings for lunch and dinner. PS! This does not include our staying guests. The kitchen follows the food calendar, ensuring the guest have meals appropriate to the season they are in at all time. 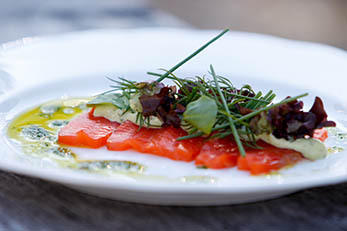 The menu is combined with the best ingredients Northern Norway offers. Wild meat from Kautokeino, Karasjok and Tana, fish from Lopphavet, Sørøya and the Alta fjord, potatoes from local farms, top quality vegetables and local berries as we harvest. The kitchen follows the food calendar, ensuring the guest have meals appropriate to the season they are in at all time. 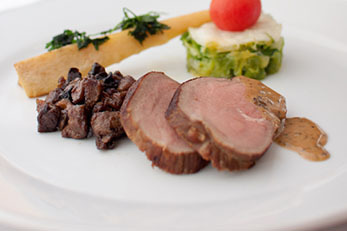 The menu is combined with the best ingredients Northern Norway offers. Wild meat from Kautokeino, Karasjok and Tana, fish from Lopphavet, Sørøya and the Alta fjord, potatoes from local farms, top quality vegetables and local berries as we harvest. We make sure that your wedding day and wedding dinner will be as perfect as you dream it to be with gourmet food, drinks and the location for your party. No extra price for planning. Extend your dinner with snowmobiling, ice sculpting, riverboat safari, clay pigeon shooting, outdoor jacuzzi, history about Sorrisniva and Alta River or other teambuilding activites. You can also hold your meetings here. Every year we offer traditional «julebord» at Sorrisniva with live music, transport and a delicious Christmas and shellfish buffet with local ingredients. The Christmas table at Sorrisniva is for those who want high class food for their celebration along with a great Christmas party! We can also offer private Christmas parties. Please contact us for available dates. Every year we offer traditional «julebord» at Sorrisniva with live music, transport and a delicious Christmas and shellfish buffet with local ingredients. The Christmas table at Sorrisniva is for those who want high class food for their celebration along with a great Christmas party! We can also offer private Christmas parties. 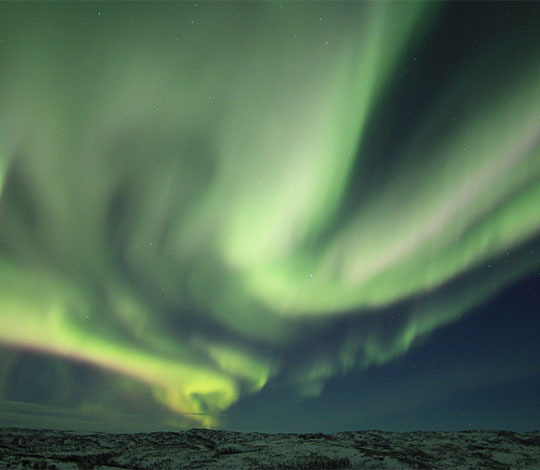 Start with a delicious 3-course dinner at Sorrisniva, followed by northern lights hunt. A perfect evening experience! 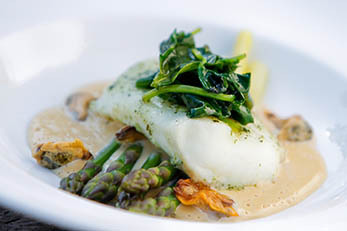 Start with a delicious 3-course dinner at Sorrisniva, followed by northern lights hunt. A perfect evening experience! You will be served a 3-course dinner based on local ingredients. The dinner will be served in a tranquil atmosphere were all the elements plays together. After the dinner our guide will bring you out on our traditional hunting for the northern lights. Local guide, hot beverage and snack and gloves. A guided tour to Alta Canyon, aperitif and 3-course dinner. The best of Alta in summer combined! The Alta Canyon is one of our best kept secrets in Alta. 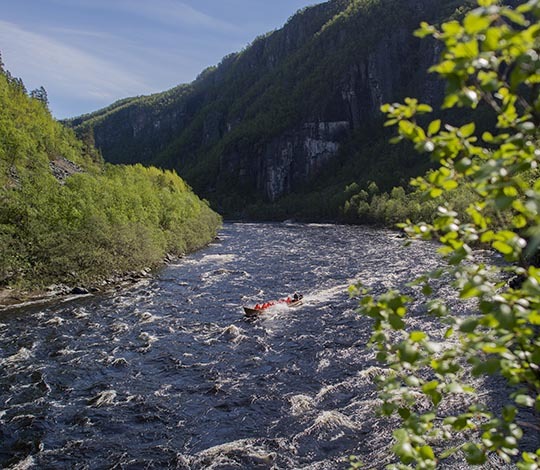 Only experienced boaters can maneuver themselves up to the top of the river, were the valley becomes narrower and the nature wilder! Alta Canyon is one of Europe’s Largest and a guided tour by riverboat is a perfect way to experience it. Listen to the stories around the River from our guides and enjoy the nature and wildlife surrounding. This is a trip suited for the whole family. The second highlight of the trip starts when arriving back at Sorrisniva. You will be served an aperitif before a 3-course locally sourced gourmet dinner, is served inside our restaurant. A perfect trip combined with lunch or dinner in the restaurant! The trip starts directly outside Sorrisniva and take you to one of the best fishing spot in the river. This trip is perfect for larger groups who want a taste of the river adventure. It is perfect to combine with lunch, dinner, meeting and other team adventures at Sorrisniva. Please try again or Email info@sorrisniva.no. Contact for reservations at least one day in advance before 16:00.